Burton criticizes that scientists overstate the risks of microplastics, misinform the public, and “adversely influence” policy making. (1) While we understand Burton’s frustration with—at times—sensationalist media reports on microplastics, we also agree with Hale that Burton’s risk assessment is premature. (2) However, the current discourse reveals a much more fundamental issue, namely, that the disciplines of environmental toxicology and chemistry have yet to find their role in the Anthropocene. 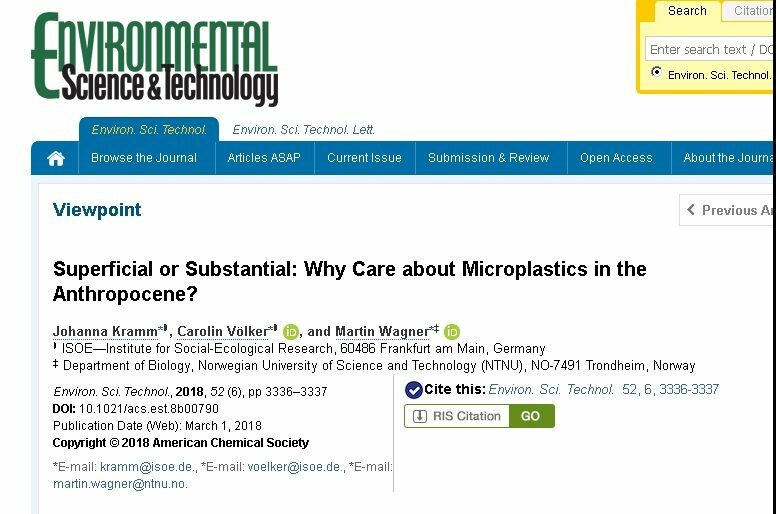 The recent microbead bans are illuminating for this challenge: societies have decided to take action on an environmental “threat” before a scientific consensus on its relevance has evolved. We can either bemoan this as being misinformed or critically reflect on why our disciplines had little say in it. We do the latter and respond 3-fold to Burton’s “Why care?” question.